As cute as this Polar Bear looks giving himself a massage on the winter landscape in the Churchill Wildlife Management Area in Manitoba, Canada, he can be extremely dangerous. The landscape in the Churchill Wildlife Management Area near the Hudson Bay in Churchill, Manitoba finally has a blanket of snow upon it which makes this Polar Bear extremely happy. As he gives himself a massage on the cold winter ground with twigs still poking through, he keeps an eye on the photographer. Polar Bears always get itchy areas where they need to scratch themselves and using the ground as a massage tool is one way of doing this. During the warmer days, a Polar Bear can be seen sprawled out across the landscape, often in the same position as this one. 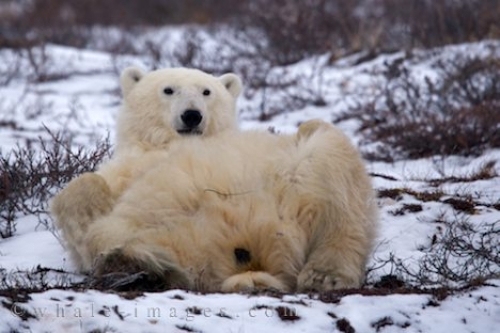 On colder days, the Polar Bear will curl up and cover up its nose which makes for another cute picture. The onset of winter is a welcoming sight for the Polar Bears in the Churchill Wildlife Management Area as this means the ice is building making it easy to reach their source of nourishment. Their favorite food source is the Ringed Seal, but they are usually untouchable unless the Polar Bear can get to them when winter sets in around Manitoba. A back massage will come next in line for a Polar Bear after finding a Ringed Seal as they have been conserving their energy for many months and are extremely hungry. Getting in the way of a hungry Polar Bear is something no one wants to encounter and keeping one's distance while bear watching in the Churchill Wildlife Management Area in Manitoba, is highly recommended.